It's been six years now since the last time an a cappella group was brave enough to steal a halftime show, however, the impact is still being felt. It was a cold and grey day in Provo, Utah. The BYU cougar football was playing well and the fans were waiting with anticipation for their beloved Cougar Marching Band to take the field at halftime. As the clock wound down, something seemed different. The band was moving slower than normal. Panic set in across the stadium. "They're going to miss their entrance," the fans shouted. "What is happening?" they asked to their bleacher mates. 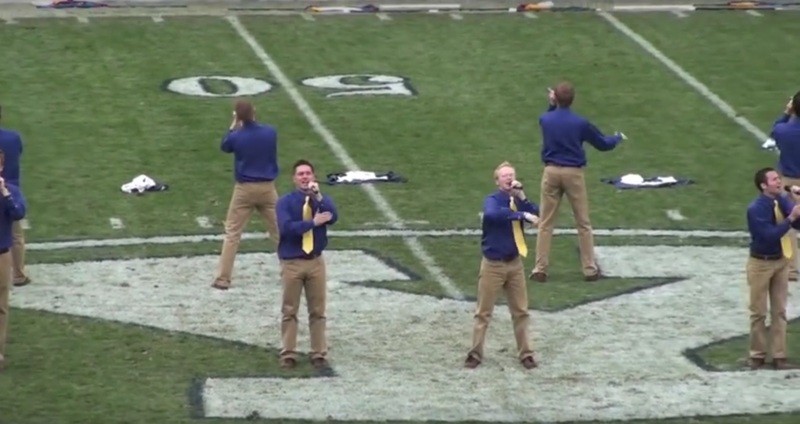 What was happening was a complete surprise and a brave move by the BYU Vocal Points. It was a bold attempt to steal halftime! Okay okay, you're right. They didn't really steal halftime. They got 4 minutes just like a visiting band would to perform a special sports themed a cappella show that is ABSOLUTELY ACA-AWESOME! More and more bands have been teaming up with campus choirs and performance groups to take shows to another level, but here the BYU Vocal Points got to perform their own show. Hopefully we will see them join the Cougar Marching Band on the field soon. In honor of our new site, College A Cappella, kicking off we want to present to you one of our favorite non-band halftime shows that we know you will all love. Please LIKE our new page and share it with all of the a cappella fans you know! Well done BYU Vocal Point!